This is an amazing story that needs to be told. It is mind boggling that it took about 60 years for us to finally learn the truth. This is a "War Story" that needs to be told. We start by going to eBay item number 6589943097, Admiral Chester W. Nimitz, Terms of Surrender Certified by PSA/DNA. Illustrated (right) is the item for sale, a copy of a souvenir German Surrender Document signed and dated by Admiral Karl Dönitz, 27.7.76. Immediately after Hitler’s death suddenly and to his great surprise Dönitz became head of the German State. It fell to Dönitz to negotiate the surrender of the German forces to the Allies. The signature of Karl Dönitz is very common and it would be near impossible to find an auction house or dealer who has not sold his signature at one time or another. Exemplars are plentiful. However, the "experts" James Spence and Steve Grad sign off on a PSA/DNA Certificate of Authenticity dated Thursday, April 24, 2003, Re: CU14136-27, PSA/DNA Certification Number B16187 (see below). 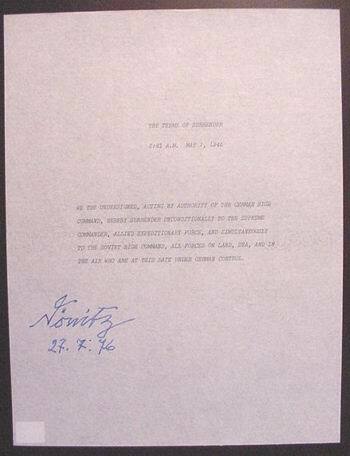 These "experts" state this Surrender Document was signed by Chester Nimitz. This is the first time we discover that it was our own Admiral Nimitz who surrendered the German Forces to the Allies in the European Theatre. An amazing historical discovery. Incredibly, he also managed to sign and date this copy over ten years after he died. The signatures of Dönitz and Nimitz are by no means similar. A novice in the field of autographs can easily tell you which is which without looking at exemplars. The only way we can even stretch a similarity is that both signatures end in "itz." This mistake is beyond ludicrous. This is the ultimate display of incompetence! How serious is this mistake? This authenticating company is one of the choices of eBay to authenticate autographs. They do so without seeing original documents and give "opinions" based on a scan. What can one learn from this story? 1) How can these people who are called authenticators also be called experts? 2) Authenticators with this talent should be called "opinionators." 3) These opinionators cannot recognize common signatures. 4) These opinionators cannot be looking at exemplars as this would never of happened if they did. 5) How much research could have been done to get this so wrong? The document was dated by Dönitz on July 7, 1976. Chester Nimitz died on February 20, 1966. 6) The uninformed collector learns how useless are the many COA’s being offered in the market. 7) Most informed dealers are aware who are the professional authenticators. It’s time to start looking at some of the dealers who continue to support certain authenticating companies. These dealers and auction houses have become part of the problem. 8) Based on PSA/DNA’s Certificate of Authenticity, the eBay seller issues his own COA with this item. Two COA’s for the price of one. The document offered here teach the world that American Fleet Admiral (Pacific Fleet) Chester Nimitz surrendered the German Forces to the Allies, and he came back from the dead to do it. History re-written, authenticated and certified by PSA/DNA all for the low cost of $429.00.